Imagine a month end without overtime. We get you there with our upfront capture and an additional 30-45 days of visibility. All with our unique flat fee initialization where tailoring is included. When we approached DataServ, our accounts payable process was disjointed, and we had a three-week document processing backlog. We would have considered it a win to reduce our backlog to just one week. 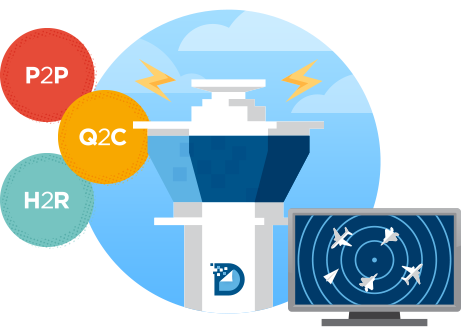 Today, DataServ’s AP automation has eliminated our backlog, and we don’t consider that a win ... we consider that a slam dunk! From the beginning, the Client Support team at DataServ was very knowledgeable about our AP process, which was really helpful. I didn’t feel the need to spend a lot of time explaining in detail what I needed. Whether I was emailing or calling the support solution desk, the response time was always impressive. I really felt comfortable knowing the team was there to assist with whatever issues I needed to get resolved. DataServ has an outstanding Client Support team! The DataServ AP automation solution has provided approximately 30% gains in efficiency in the departments where it’s been implemented. A large part of that can be attributed to our newfound ability to route invoices around our company via email for approvals and analysis. We now have metrics we can use to monitor our productivity which is something we never had before. In the end, this AP automation has resulted in better invoice control and a better managed AP document process. Tailored Accounts Payable Automation that reduces costs, frees staff, mitigates fraud, and streamlines processes. Create a paperless reality built on an OCR-ingestion approach that delivers clean and useable data – all while ensuring 99% pre-ERP accuracy. Reduce processing times with responsible controls, distribute coding without the errors, and document and enforce your delegation of authority. Keep compliant with eInvoicing initiatives around the globe – no matter the country or technical requirements. Set up currency controls in your invoice approval process so rules are in place, regardless of the currencies in which your vendors invoice. Offer secure access directly to your vendors who are inquiring about payment status or invoice issue resolution. Enable employees to submit expense information, capture receipt images, and provide expense data back to your system for automated processing. Eliminate the manual comparison or matching work in your AP department, and make the most of your PO process by having invoices automatically scheduled for payment, leveraging the latest in artificial intelligence. Allow your employees to request payment on demand when invoices or credit cards just aren’t feasible. Take advantage of direct shipping from a manufacturer without the pain of routing invoices through multiple channels and long DSO times. Efficiently request, route, approve, audit, and process requisitions or purchase orders with automation. Grant employees and vendors the ability to facilitate collection of data for new vendor onboarding, upload critical documentation, and make key information updates with a set approval process for control. Distribution of Wente wines was expanding nationwide and the company needed to keep costs under control while still growing top line revenue. To expand invoice volume without adding staff, Wente turned to DataServ for an AP automation solution. Ohio Transmission was able to eliminate manual keying and document handling from their AP process and receive 99% pre-ERP data accuracy after they initialized the Single Stream Accounts Payable automation solution from DataServ. With DataServ's AP automation, Arbill has one solution that can handle both purchase order and non-purchase order invoice processing, as well as improved document control, auditability and retention management. Single stream invoice processing solutions eliminate the manual keying and document handling that plagues most accounts payable departments. Eliminating these steps reduces time spent by 80% and provides 99% pre-ERP data accuracy. Eliminating manual tasks frees your accounts payable staff to focus on value-added tasks such as reporting and analytics, increasing communication with suppliers, better maintenance of the vendor master, negotiating more early-pay discounts, helping error-prone suppliers, and strengthening fraud controls. Make ‘going paperless’ a reality. Everything is scanned, processed by optical character recognition (OCR) and ran through our quality assurance process producing 99% accurate, clean, usable data. Index, validate, and approve with a click. Our mobile approval applications and email alerts give your organization the access you need. Our SaaS solutions include currency conversion capabilities and browser language choices to support users in ~50 countries. Your AP solution is waiting for you.